Once your new granite worktop or marble floor is installed, you’ll want to keep it looking its best. Many people worry that natural stones like marble and granite will be hard to care for or damage easily. Luckily, this isn’t the case. In fact, marble and granite floors in palaces and churches have been in regular use for hundreds of years and still look great. To keep your natural stone worktop, floor or tiles looking as good as new, simply follow a few simple guidelines. Most of these are so obvious you’re probably already doing them, so you won’t even need to change your routine. While natural stones like marble and granite are usually sealed, making them hard to stain or damage, if abrasive substances are left in contact with the surface, they can cause a stain or, more likely, dull the polish. This doesn’t affect the usefulness of your worktop, but a lemon-shaped dull patch can be really annoying. Some cleaning agents contain bleach or other strong chemicals that can easily dull a highly polished surface. Highly polished surfaces rely on the stone being completely smooth and reflecting light. This makes them more vulnerable to scratches or dulling, so take extra care with these. Marble and granite are strong, resistant materials and don’t tend to absorb dirt or germs so wiping them down with soap and water is usually sufficient. Again, this depends on the finish and colour of stone you’ve chosen. 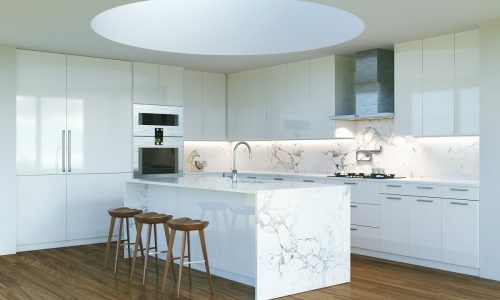 In general, natural stone is heat resistant and hard to stain, but if you use a coaster for red wine glasses and a heat mat for dishes straight from the oven, you won’t have to worry about getting an unsightly mark on your new white marble worktop. Hundreds of feet can dull marble and granite floors. This isn’t usually a problem in the home, but marble and granite is often used in luxurious hotels and exclusive businesses. Carpet in high traffic areas can protect the stone floor, but the carpet will usually wear out quicker than the stone would dull, so it’s not necessarily a cost saving. If, despite your best efforts, your granite worktops or marble bathroom tiles lose their lustre over the years, it is possible to repolish and refinish natural stone. This is best done by a professional, who will work with the original treatment. The polisher can either restore the stone to its original finish or give marble and granite pieces a new, more up-to-date finish. We’re not going to pretend that marble and granite can tell if you’re stressed. But it’s important to remember that natural stones are incredibly hard and durable. It’s hard to stain, chip or damage marble and granite so while it’s worth a little care to avoid obvious dangers, the important thing is to be able to enjoy your home.